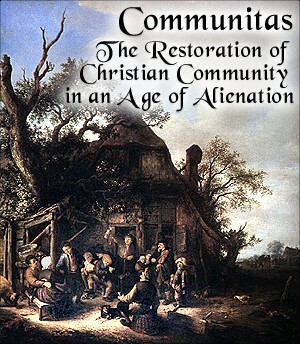 and overarching political structures, it is essential to understand the natural and historic role which they play in preserving faith and true freedom and the factors which undermine their influence in the lives of individuals.This series will seek to investigate the true nature of community in its relation to the embodied faith of a people, with its ultimate reference revealed in the doctrine of the Trinity and the communion of saints. 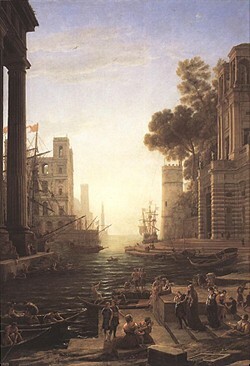 Ideological and historical trends such as individualism, collectivism, materialism, the fragmentation of formal unities in art, and the effect of the segregated contemporary built architectural environment will be considered in light of their corrosive effects on such traditional communities. The tradition of Catholic social thought, which offers clear analyses of man's social nature from a Christian perspective and principles which can assist in the revitalization of Christian communities, will be examined. 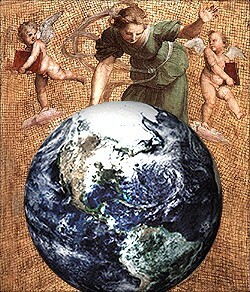 Febraury 23, 2003 - Individual, Community, and Globalization: What is the Role of Religion? Speaker: Sister Margaret John Kelly, Ph.D., Executive Fdirector of Vincentian Center for Church and Society at St. John's University, Long Island. 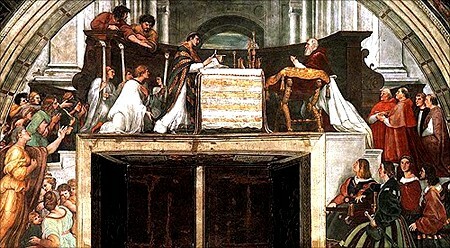 From the landmark encyclical Rerum Novarum by Leo XIII to the powerful pronouncements of John Paul II in Centessimus Annus and Evangelium Vitae, the Church's social thought has sought to clarify principles upon which a just society ought to be based while offering insightful critiques of the age. This thought is based on Christian revelation and perennial philosophy in relation to its social dimension. It is, in fact, a more scientific elaboration of Christian teaching in relation to man's social life founded upon the Gospel and Christian anthropology which finds its ultimate source in the Trinitarian life of God. Sr. Margaret John Kelly will introduce and elucidate this rich intellectual legacy and it pertinence for our day. 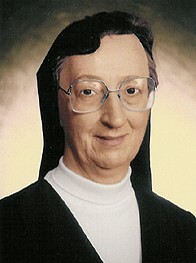 St. Joseph's College in Emmitsburg, Maryland and Laboure College in Boston, where from 1973 to 1980 she served as President. Sister Margaret John pioneered the work of Mission Services at the Catholic Health Association of the United States from 1980-1984 as she coordinated national activities in Catholic identity, pastoral care, ethics, and religious sponsorship of health care facilities. She has served on the Provincial Council of the Daughters of Charity, Northeast Province; as Provincial Superior of the Northeast Province of the Daughters of Charity; and as a Special Assistant to the President and as Interim Dean of St. John's College of Liberal Arts and Sciences at St. John's University. She currently serves as Executive Director of the Vincentian Center for Church and Society that was initiated in 1994 to support the Vincentian character and Catholic identity of the University. She has written and lectured extensively in the areas of management, leadership, trusteeship, education, and health care. The Individual, Community, and Globalization: What is the Role of Religion? Topic: The Individual, Community, and Globalization: What is the Role of Religion? Globalization is the secular ideology and world revolution of the new information age. Like the secular idologies of liberalsim, socialism, and nationalism of the earlier industrial age, globalization has assaulted communities and individuals whose identities are based upon Christian principles and practices. This new global ideology and its world revolution, however, is producing new opportunities for the world religions and for their conceptions of community and the individual. In the midst of this great conflict of worldviews in the 21st century, an essentail guide will be the teachings of Catholic social thought. visiting professor of political science at the University of California at San Diego, and visiting professor of strategy at the U.S. Naval War College. 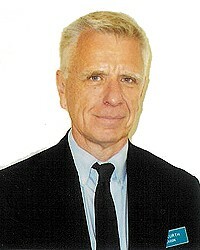 Professor Kurth is the author of some 80 professional articles and editor of two professional volumes in the fields of international politics, foreign policy, and the politics of Western nations. His recent publications have focused upon the interrelations between the global economy, post-modern society, liberal ideology, and cultural conflicts. In 1998, he delivered the Templeton Lecture on "Religion and Globalization." James Kurth, "War, Peace, and the Ideologies of the Twentieth Century," Current History, January 1999, pp. 3-8. James Kurth, "Religion and Globalization," Foreign Policy Research Institute Wire, May 1999. James Kurth, "Confronting the Unipolar Moment: The American Empire and Islamic Terrorism," Current History, December 2002, pp. 403-408. Read America versus the West? Speaker: Dr. Evelyn Birge Vitz, Professor of French and Comparative Literature, New York University and author of A Continual Feast: A Cookbook to Celebrate the Joys of Family and Faith Throughout the Christian Year. 3) the members of the Church Triumphant in heaven. In this lecture, Dr. Vitz will discuss the basic structures and rhythms of the liturgical year and show how it emphasizes both change and eternity. She will discuss the construction of the Christian year over the centuries, from the very earliest centuries of the Christian year. She will quote some of the many Fathers of the Church --and women writers as well–who spoke of it and praised it. She will also show how we can draw on its strengths and beauty, and live it more fully today. Dr. Evelyn (Timmie) Birge Vitz, a native of Indianapolis, Indiana, received her BA from Smith College and her PhD in French from Yale University. Since 1968 she has taught at New York University, where she is Professor of French, and Affiliated Professor of Religious Studies and Comparative Literature. She is a specialist in the literature and culture of the Middle Ages. For many years she directed the Program in Medieval and Renaissance Studies at NYU. Aside from her cookbook A CONTINUAL FEAST, she has published several books and many articles on medieval literature, in particular on saints lives and the liturgy. She and her husband Paul C. Vitz are both converts to Catholicism, having come into the church together in 1979. Mrs. Vitz has written for MAGNIFICAT and CRISIS, and has given many talks on Christianity, family life, the combining of career and family, and others. The Vitzes have six children and two grandchildren (also two dogs) and live in New York's Greenwich Village.